Haq's Musings: Pakistan Manufacturing Humvees for US Troops? A report in Asia Times On Line claims that Pakistan has received secret orders from the US to build 1000 Humvees at HIT (Heavy Industries Taxila). These vehicles are needed urgently for the expected US troop surge in Afghanistan and possibly for more action in Pakistan's FATA region. The apparent reason for secrecy is the political sensitivity amidst strong anti-American sentiments prevailing in Pakistan after recent US military incursions and predator attacks in FATA. ATOL's Syed Saleem Shahzad claims that the "work on the Humvees has already begun, although the task is being undertaken in secret". Heavy Industries Taxila (HIT) is the backbone of Pakistan's Engineering Industry for the Pakistan Armed Forces, being a combination of multiple industries that has grown into a large military complex in the last decade. It has six major production units. Heavy Industries Taxila is one of the largest defense production facilities in Pakistan with a manpower of over 6500 highly skilled personnel and engineers trained in the field of defense production. Out of the 6500 employees, about 30% are uniformed personnel. The Organization provides facilities for the overhaul, rebuilding and manufacturing of Main Battle Tanks, Armored Recovery Vehicles and Armoured Personnel Carriers and has recently developed and produces MBT-2000 Al-Khalid Tank. In addition it rebuilds, upgrades and modernizes Armored Vehicles of various origins. Humvees for the US troops are currently produced by AM General, an American heavy vehicle manufacturer based in South Bend, Indiana. While HIT has been exporting heavy armaments to many countries, the reported Humvee order represents the first major HIT deal for the U.S. Earlier in July of this year, Major General Mohammad Farooq, Director General of the Defense Export Promotion Organization, had indicated that collaboration with the United States had increased in manufacturing armored personnel carriers "with transfer of technology". According to a July report in Pakistan's Dawn newspaper, General Farooq claimed that Pakistan’s defense exports have tripled to around $300 million because of the quality of its ammunition, anti-tank guided missiles, rocket launchers and shoulder-fired surface-to-air missiles. He said exports to South Asian, Middle Eastern and African countries had increased significantly. General Farooq said optical instruments like night vision devices, laser range-finders and designators, laser threat sensors, artillery armor mortars and munition, mine detectors, anti-tank rifles, missile boats, different types of tear gases, fuses of unarmed vehicles, security equipment and sporting and hunting guns were also being manufactured in Pakistan. “The fuses are being purchased by countries like Italy, France and Spain,” he said. In reply to a question, he told Dawn, Pakistan’s military exports were higher than India’s. “Indians started working on Arjun tank but, they are yet to induct it in their army, while Pakistan has built and handed over Al Khalid tank to the army, although it started the program later,” he said. Lately, Pakistan has come under severe criticism by human rights groups for being a leading manufacturer and exporter of land-mines, cluster bombs and depleted uranium munitions. While the reported US order for a thousand Humvees is an opportunity for Pakistan to earn badly needed foreign exchange, it could become a serious political headache for Zardari administration. The deal could also raise hackles of those in the United States who oppose any vehicle-related outsourcing when the US auto industry is in deep trouble. I will take Salim's words with a grain of salt... his predictions and analysis has been very shallow... Reading his articles in Asia Times on regular basis, I concluded that he is just a noise machine who is clinging to a subject that is beyond his grasp. i don't believe it either. the federal government is required by law to only deal with the contractors pre-approved by congress. so even if Pakistan provided a better offer, the u.s government is obligated to complete their contract with AM general. if the contract expires then manufactures have to submit bids for approval. which means we would hear it all over American news, considering the loss of jobs to overseas is a hot topic in America. also with the mixed emotions about Pakistan. strategically it would be a great move. 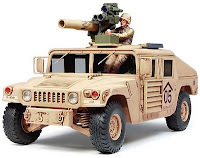 not only to cut the cost of shipping humvees to be used by the Pakistani military. it would also provide jobs, Zardari in an announcement the other day called upon once again the military to relinquish control to the civilian government. although that announcement was geared to create a more cohesive and effective campaign on extremists. the trickle down would see the replacement of uniformed workers to civilian. but does Pakistan really want to make themselves a producer of weapons. look at all the other leading weapon production countries. like in America, it too will create a conflict of interests. in America its called the industrialized military complex, it helped to continue the Vietnam war. it first became a necessity, then a profitable endeavor, and it still has its fingers in almost every facet of American government. I am not sure about the veracity of Salim Shahzad's report. But I do believe it's within the realm of possibility, as confirmed by Gen Farooq's remarks about US "transfer of technology" to HIT for armored vehicles. I believe there is a clause in US defense contracts that permits the Pentagon to order from another supplier if the primary supplier can not fill the order in a timely manner. I think the troop surge in Afghanistan is happening at an accelerated pace and they need more Humvees than AM General can supply. I think Pakistan Army, like China's PLA (People's Liberation Army) is very good at setting up and managing industries. In the absence of a strong private sector in heavy manufacturing in Pakistan, Pakistan Army has no choice but to fill the gap. It'll probably change with time as the private investors see opportunity and decide to come in and build more plants.